Not all advice is good advice! I love reading Better Homes and Gardens magazine. I never subscribed to it, but for some reason they keep sending me the issues. I find that it’s a great place to get ideas that never work in real life. 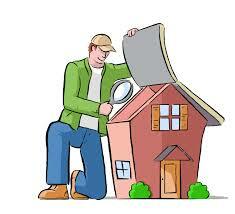 But I still enjoy looking at it; I enjoy seeing the colors, styles and decor of dream houses – that stay dreams. And then there’s the practical tips page; the ones that promise you the easiest solutions to all your problems, guaranteed to work and fail proof. I don’t know who writes them, but it’s certainly someone with little life experience. Or someone who was never a mom. 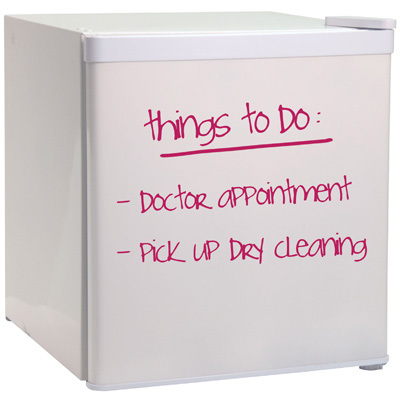 Post a dry erase board on the refrigerator and every time you remember something, run out of something or need something, just jot it down on the board and presto, at the end of the day your list is made and nothing is forgotten. Well, I laughed out loud and couldn’t help imagining what would happen if I tried this in my house. I’d start the day off with breakfast, and we’d run out of cheerios. I’d quickly jot it down on the whiteboard. The kids get dressed, and I notice 5 year old has yet another pair of pants with ripped knees; I quickly jot down to buy more size 5 pants.. I remember I need to make dentist appointments, and I quickly jot it down. Ran out of mayo, no problem, it’s already on the list. More tissues. There it goes, onto the whiteboard. No more trying to remember things; the white board is doing it for me! Somewhere between supper and bedtime, one of my kids – don’t know if it’ll be 3, 5, or 7 year old, will notice the whiteboard. And the dry erase marker. And there are fewer things more tempting to little hands than a dry erase board. I’d say it comes in at a tie to a Sharpie marker. And in one little swift giggly move, gone would be my list. And the contents of my brain. And a whole days work. With no way of ever getting it back. And in it’s place would be some indecipherable modern art drawing, probably with Sharpies. Yes, dear dry erase board and brilliant ideas writer in Better Homes and Gardens, please put a disclaimer with such ideas that for reasons of sanity, not to try it at home until the kids are married and have moved out. Not all advice is good advice, and not all good advice is good advice for everyone. For me, my Little Yellow Notepad works. For some it’s Post It notes or a spiral notebook. Good old fashion ink-on-paper. And even if little hands get hold of it and try to destroy any level of organization I’ve worked so hard on establishing, I can always get on my hands and knees, collect all the bits and pieces and tape them back together. Trust me it works; I’ve tried it. What is it with us moms that we never tire of hearing about other people’s kids’ crazy antics? 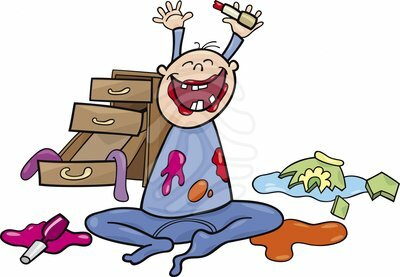 There’s such a thrill and satisfaction in seeing someone else’s house covered in flour, marker on someone else’s white couch or even just toys strewn across the floor from wall to wall. I can look at photos of such stuff and listen to people talk about it for hours on end. And the truth is, I think I know why. Because it validates me. Of course I know it can’t just be my kids and my house; but there’s nothing like seeing it to feel comforted. And so hence the obsession. Somethings are funny only when it’s not my own kids. The other day I was at an event with some of my kids. I was talking with some people near the food table, and out of the corner of my eye I noticed the table lifting upwards slightly. As a mom, that didn’t startle me. That’s a normal thing. But I was sure I knew who was under the table, making it happen, and I could feel the annoyance at my kids rising for hiding under the table. Ready to call my sons’ names and demand they come out, two little heads popped out from under the table. And miracle of miracles, they did not belong to my family! Actually, I thought it was funny. Cute. Whatever. It really wasn’t a big deal, didn’t disturb me in the slightest and totally didn’t matter. But more than that, I was amazed. Where did the annoyance go? How’d that happen so quickly?? Why, if it was my own kids, would it bother me so greatly? And why, when I discovered I wasn’t related to the culprits, did I barely give it a second thought? I filed that image in my mental mommy files, one to keep in mind when my kids are up to something like that the next time – other kids do that too. It’s OK! And that goes back to the obsession; we so enjoy seeing other kids doing stuff like that. Yesterday was a good example of a day that would have been funny if I was with someone else’s kids. It was Wednesday, the no school day. It’s the day of the week that the four younger ones are home with me. And it’s always an action packed day. 7 and 5 year old found a wilting lulav branch in the garage; after fighting over it for ten minutes or so, they went out to the backyard to play some game that I decided not to see. But the winner of the game was apparently the neighbor, because that’s the backyard the lulav branch ended up landing in. Great, just what I needed. Another reason for the neighbor to be annoyed at us. Off they went, back to the garage, hunting for something else. In they came with a big grin and a bottle of diet coke they had found hiding in the garage fridge, that one of our guests had left behind. They were ready to make a L’chaim and enjoy it, but I crashed the party and poured it out. Back they went, looking for some more stuff. They went to play in the backyard again; I had to make supper, it was getting late and we had to get to swimming lessons. Pretty funny, if it was someone else’s kids. And back to trying to finish up my quick dinner; but this time with the helpers indoors. And the salt contents poured on the floor once again, in a nice neat mountain. And the love-hate relationship I had with the water dispenser on the kitchen door…well at that moment it was all hate, with ice shooting across the kitchen. And three year old gave himself a nice beard with the new markers, a combination or orange and brown. To match the colors of his arms. And I noticed they moved their tic-tac-toe game to the couch, and I mean literally to the couch. There on the armrest was a nice tic-tac-toe board, that I hoped would come off with a clorox wipe. But I had no time to allow myself to be annoyed. We had to get to swimming lessons – so off we went. Three year old with a multi colored beard, and 1 year old looking like he came through the chimney..
Only after arriving, did I notice that no one had bothered taking their shoes with them. And they were all as happy as can be. And I used all my effort to imagine that this crew of adorable little wreckers were someone else’s kids, because then I’m sure, at that moment, I’d be happy too.